Since 1982, Stroud Water Research Center employees and volunteers have helped plant hundreds of thousands of trees in Pennsylvania, beautifying the landscape while restoring and preserving water quality. Every tree we plant plays a vital role by providing a natural buffer zone between our land use and the stream it protects. Each tree helps prevent pollutants from entering our freshwater systems and provides lasting benefits of shade, beauty, and the natural habitat essential to a healthy ecosystem. On April 4, hardy volunteers from Dansko and Lincoln University were joined by individual community members braving cloudy skies and chilly winds to plant trees in White Clay Creek watershed near Landenberg, Pennsylvania. One thousand seventy-five native trees were planted and protected with tree shelters by 33 volunteers. The tree species breakdown was 125 basswoods, 100 hackberries, 50 flowering dogwoods, 125 black gums, 100 river birches, 125 swamp white oaks, 125 pin oaks, 100 red maples, 125 silver maples, and 100 American sycamores. Funding for this project was provided in part by Wild Birds Unlimited – Hockessin. 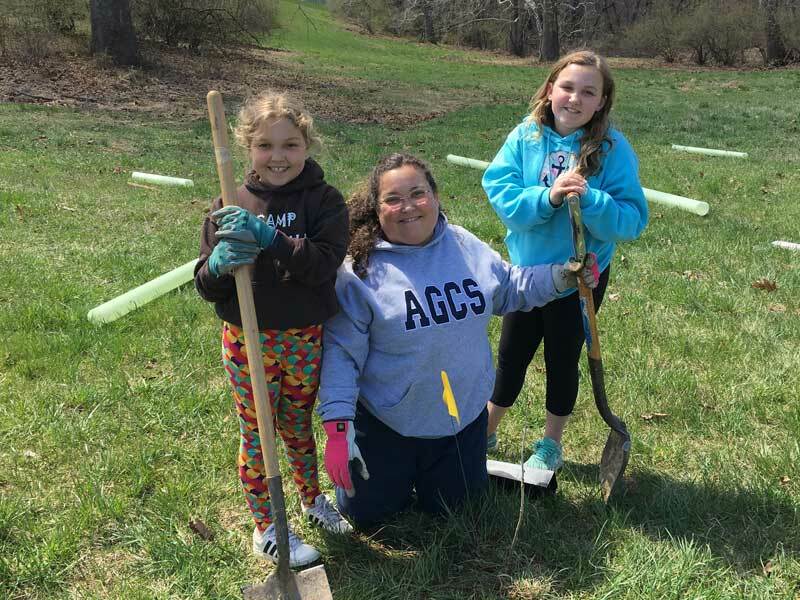 The sky was blue as volunteers from Exelon Generation, M&T Bank, Wilmington Trust, the Southern Chester County Young Business Leaders, Lincoln University students, and local community members joined forces to plant trees near Coatesville, Pennsylvania. The planting took place along two swales that transport rain water into Buck and Doe Run. Buck and Doe Run is a major tributary of the Brandywine River, which eventually flows downstream to provide drinking water for the city of Wilmington. Seventy-six volunteers planted 900 trees —150 of each of the following species: silver maple, river birch, black gum, American sycamore, pin oak, and basswood. Funding for this project was provided by Exelon Generation and TreeVitalize.